Glenn has officially lost all faith in the Cloud Queen. ‘Tis a sad day indeed. Dewey nominated for best character, also nominated are Glenn and that bird-hooded puppet kid. Randal the Vandal for Kell of Kells 2015. Are the gelbobbers supposed to be vicious or viscous? I would not be surprised if it was both. so much lore ahhhh I lov eit. The plot thickens! The Remnants are probably Essentia related, then. Maybe. In the third panel, it’s amusing to read Dewey’s snout line as her mouth with a lip wrinkle underneath it. Anyone else notice the gelbobber is posed like onionsan? Get out your pokeballs! 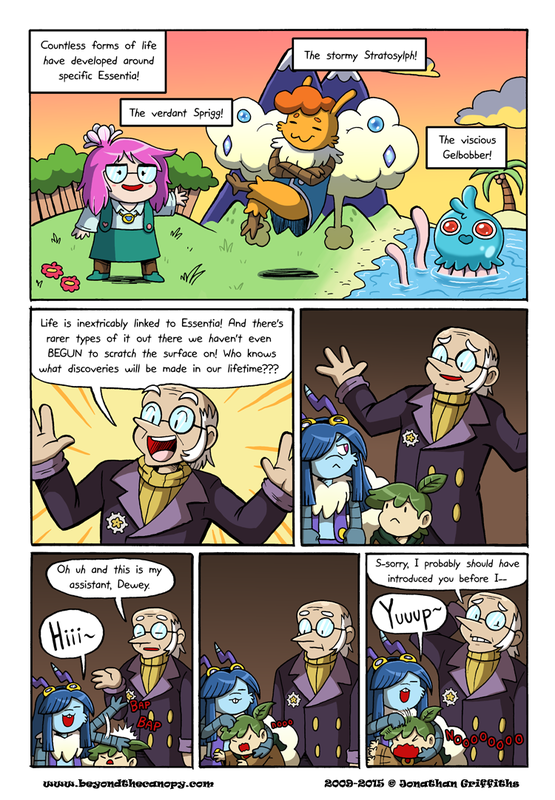 There’s a tentacool in the first panel on the right! Yeah, Dewey! Bap him like a giant golf ball.